Way back in 2013, a new Swedish project called WACHENFELDT released their debut EP “Colophon”. After much anticipation, this year sees them back with their debut full-length album “The Interpreter”, clocking in at just under an hour. Styled as a Blackened Death/Thrash band, WACHENFELDT comprises three very talented musicians, known from their involvement from other bands such as ENTOMBED, OST+FRONT, and MÅNEGARM, to name a few. And from this melting pot emerges a malevolent ferocious monster of an album. With little intro, “Spirits of the Dead” comes bursting in, a cacophonous assault of frantic drumming and a torrent of tremolo picked guitars. This gets coupled with guttural and harsh vocals, setting a punishing pace for the rest of the album. Redolent with tempo changes, Symphonic embellishments, searing guitar solos, and odd melodic parts, this is a monstrous opener to the album. Following on from this is the machine-gun “Arhan”, showing off a far more Blackened style than its predecessor. One thing I absolutely loved about this song, and to a lesser extent the ones that follow, is the generous use of the bass guitar. All too often the bass gets completely lost in the mix of an album, but here it is used as a solid backbone to the song, whilst the more Blackened sections add an evil feel to the overall brutality. Next, we come to the eponymous “The Interpreter” which manages to showcase a perfect meld of brutality and melody, of malevolence and grandeur. Here we get a glimpse of how perfectionistic WACHENFELDT can be; every swirling note in the maelstrom of a song is in its rightful place. “Ut” on the other hand has a slower and more menacing feeling to it, scintillating between odd minimalistic parts that sets an uneasy atmosphere before repeatedly plunging back into a morass of a melody, drowning in desolation. This is the most experimental and ponderous song on the album, weighing like a loadstone around your neck. At the pinnacle of the album is the much needed “Interlude – Aiwass”, which offers us a short instrumental break, sounding almost like the soundtrack of an old horror movie. 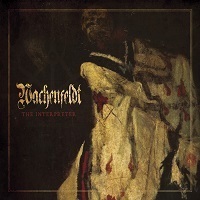 This then leads to “Colophon”, the first of the three remastered songs from WACHENFELDT’s 2013 EP, along with “Hymn to Lucifer”, and “Litany to Satan”. In contrast, “Athor and Asar” sees the sound carrying on in the more old school Death Metal sound, albeit with a twist towards the realms of Technical Death, with a pulverizing song that continues the total annihilation that is “The Interpreter”. If anything, “The Ladder” is even more frantic and frenetic, its aural onslaught a veritable barrage that flattens anything still standing in its path. Closer “Necrophiliac” sees some more softer orchestrations right in the background, lending an imperial air to the destruction of a melody that dominates the forefront of the song, and by the end of it, all resistance has been completely obliterated. Darker parts add a more discordant feel, making sure that, if nothing else, WACHENFELDT don’t go out without one last fight. Overall, “The Interpreter” is a very multi-faceted album, with a slew of other influences coming to the fore, along with the previously mentioned beautiful chunky bass. Despite the numerous styles, the album is completely punishing and unrelenting, and doesn’t sacrifice an iota of its brutality. This can sometimes have the feeling of “too much of a good thing” though, with WACHENFELDT delivering one punch after the next with no reprieve in between. But then again, that might be exactly what you’re after. If you’re into Blackened Death, this is definitely an album worth checking out, as“The Interpreter” is as monstrous as it gets. Prepare to be demolished.